Three schoolboys are drawn together by their status as heirs to dukedoms. The bonds forged then endure. Later, the three pledge their loyalty to one another as the members of an exclusive group, the Decadent Duke’s Society. The loyalty that unites Adam Penrose, Duke of Stratton; Gabriel St. James, Duke of Langford; and Eric Marshall, Duke of Brentworth survives maturity and separation. 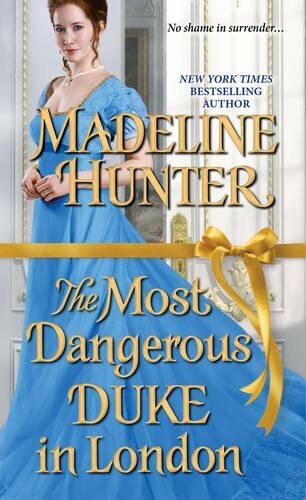 The Most Dangerous Duke in London is Stratton’s story. The Duke of Stratton, has recently returned to England to investigate the circumstances that led to his father’s suicide. He is skeptical but curious when the Countess of Marwood requests his presence at the country estate of her grandson, the new Earl of Marwood. Adam suspects that his reputation for duels and her concern for her grandson lie behind the countess’s maneuvers, but he is unprepared for her proposal that he marry her younger granddaughter to put an end to the decades of enmity between the Penrose and Cheswick families. Seventeen-year-old Emilia, despite her undeniable beauty and impressive dowry, is too young and too compliant to appeal to Adam, but he finds her elder half-sister intriguing. Lady Clara Cheswick was her father’s favorite child. She enjoyed an unusually close relationship with him, and he encouraged her in an education and a freedom rarely allowed a female. At twenty-four, Lady Clara is still unmarried and content to remain so. Her father’s will provided for her generously enough to allow her to live independently of her brother and her paternal grandmother and to continue to reject marriage. Lady Clara is using part of her inheritance to implement more regular publication of Parnassus, a women’s journal that encompasses politics, literature, and fashion. Lady Clara serves as its publisher and benefactor. Loyal to her father, she is opposed to her grandmother’s plans and disinterested in Adam’s proposal to marry her rather than her sister, but she cannot control a reluctant attraction to him. Adam persists in the face of Clara’s repeated rejections. His ducal friends, Langford and Brentworth question his motives, but even Adam himself is not sure how much is his real fascination with Clara and how much is the hope that she possesses information he needs about her father’s role in his father’s death. A friendship of sorts develops between Adam and Clara. She has the intelligence and spirit he needs in a woman, and she is seduced as much by his recognition of her as an equal as she is by his undeniable physical attributes. The friends become lovers, but their feelings are tested as the twisted story of choices that harmed his family and fostered the flourishing of hers unravels. Will love prove more powerful than the need for revenge? Madeline Hunter introduces her Decadent Dukes trilogy with a complex story featuring compelling protagonists engaged in a relationship that captivates the reader from beginning to end. This is a novel in which the conflicts, internal and external, are organic rather than contrived. Clara’s reasons for avoiding marriage are valid in a culture that denies a married woman any rights to her own property and to a separate legal identity. Adam’s anger and anguish over his father’s death and his mother’s ostracism is legitimate. The false rumors that pushed Adam’s father to take his own life are real. Both Clara and Adam are pulled between desire and reason, and their caution in declaring their feelings is understandable. Too often I have been disappointed by an active heroine’s independence melding into passivity by the story’s end. That is not the case here. Clara remains an active participant in the resolution. I found the ending of both the romance and the suspense thread totally satisfactory. Hunter gives her readers enough of a look at Langford and Brentworth to establish them as interesting characters who deserve their own stories without permitting them to weaken the focus on Adam and Clara. All of these qualities helped to make this a superb read. If you like intelligent romance fiction with dimensional, mature characters, I highly recommend this novel. I eagerly await the next book in the trilogy, the story of Langford, a charming rogue who has already won my heart. This series promises to be as good as Hunter’s Wicked trilogy—and it provided some of my favorite romance novels of 2015-2016. I was happy to read the heroine was not only happy to be unmarried but also not a young lady. It sounds like I'll be enjoying this series very much. I like that about her too, MsAwesome. I always love your reviews. This sounds wonderful. I always love your reviews. I need to catch up with her books. I missed the last series. Too many good book, not nearly enough time! This series does sound very good and I'm ashamed to say that I have not yet read any of these yet. Good grief! How do I miss these great books and WHY do we readers have to waste time sleeping? I have really enjoyed her stories - thanks!